Laminate flooring is a high quality, affordable, easily maintained flooring. It is both durable and practical; it doesn’t fade and is resilient to scratches and marks from furniture and shoes. It is incredibly hygienic and suitable for any room including kitchens and bathrooms. 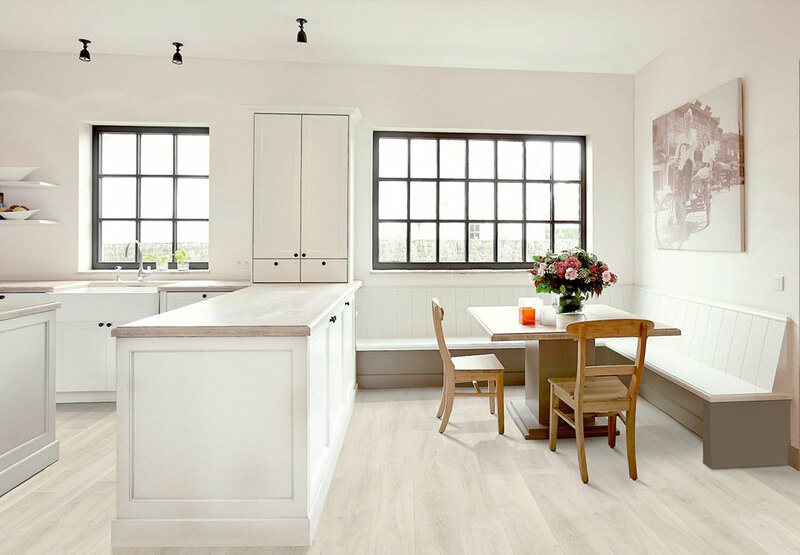 Laminate flooring is ideal for domestic and commercial settings and is available in a wide range of finishes and designs. 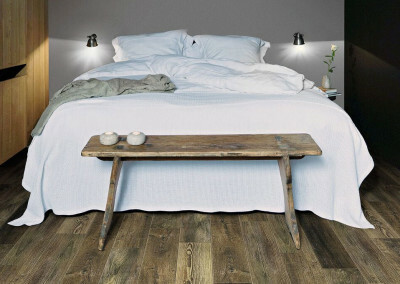 We provide laminate flooring from high quality and trusted brands including Quick-Step, Balterio, Woodpecker, Egger, Balterio and Lifestyle Floors. Our range is ever-expanding and we also stock high-quality laminate flooring ready to take home from just £8.99 per square metre. 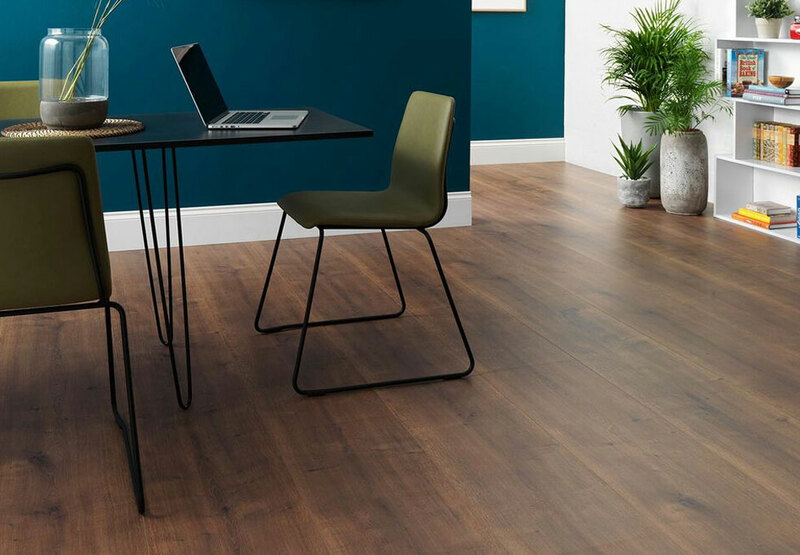 We offer hundreds of laminate flooring options in a range of styles including stone, tile, concrete and wood for both residential homes and commercial premises. 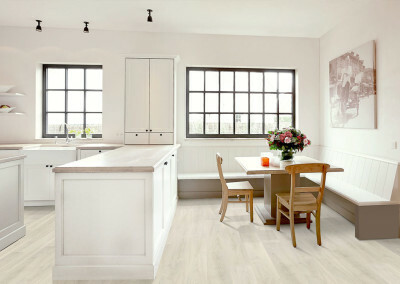 Where can I have laminate flooring installed? Because laminate flooring is essentially comprised of compressed wood, we don’t recommend that it is installed on wet or humid locations such as a bathroom, wet room, sauna, enclosed veranda or anywhere that will get wet. This is because it could cause your laminate flooring to warp or swell. When can a laminate floor be installed in a bathroom? If you would like laminate installed in a bathroom we recommend that any water and spills are mopped up and dried straight away. We recommend using laminate in a larger bathroom or where there is good ventilation. However, we would recommend that you opt for a more water resistant floor covering. 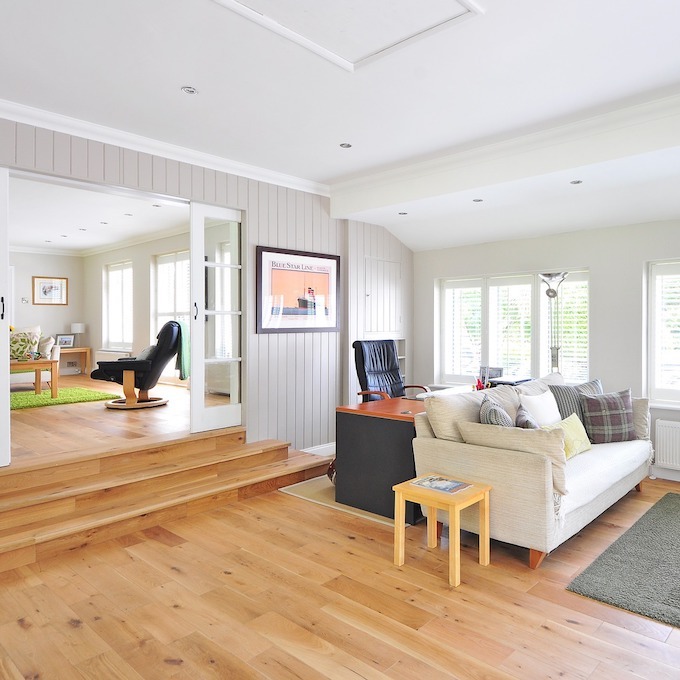 What are the advantages of laminate flooring over hardwood flooring? Laminate flooring is typically half the price of hardwood flooring (and sometimes the savings can be greater), which for some is an obvious advantage. 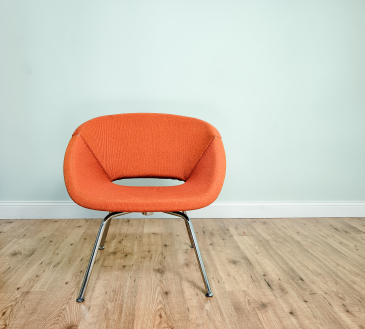 Laminate flooring is easy to install and can be installed as a DIY job rather than getting it expertly fitted (although there are many disadvantages to doing this!). Hardwood flooring needs a level of expertise and skill, which many DIY enthusiasts simply don’t have. Laminate flooring can be installed quickly, and because it’s scratch resistant, fade resistant and the products available are such good quality many customers opt for laminate over hardwood flooring. How do I maintain my new laminate floor? 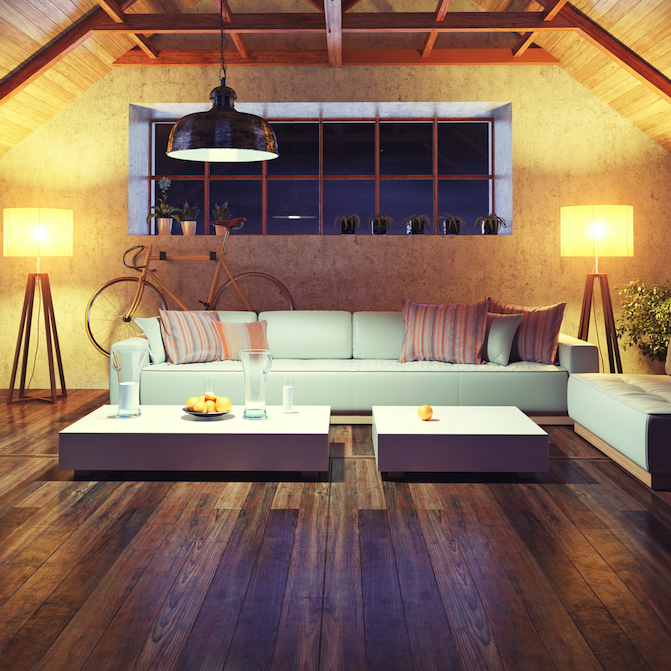 Laminate flooring really is one of the easiest flooring types to care for. It is incredibly resilient and can be fitted in any room for a stunning finish that will last for many, many years. We recently re-fitted some 8-year old flooring in a customer’s home. 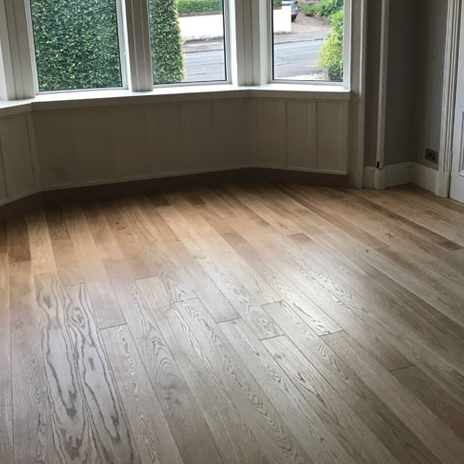 They wanted to change the living areas to hardwood and as the laminate was as good as the day it was fitted we replaced the carpet in the main bedroom with their unwanted laminate at their request, and it looked as good as when we installed it new. To maintain your laminate floor we advise our customers to vacuum them regularly and use a damp – not wet – cloth to clean up any spillages. Make sure that you don’t use too much water or cleaning detergents to clean your laminate floor. The best method for cleaning is to vacuum or sweep your laminate flooring first to clear any loose dust or grit. Then spray a fine mist of water over the floor in manageable sections, and then wipe them dry making sure you don’t use a non-abrasive, clean cloth. Why do I need to use a DPM on a concrete subfloor? There can be a lot of moisture stored in concrete floors that you are unaware of. You need to make sure that there is no contact between this moisture and your new laminate flooring otherwise it will ruin the floor. We recommend installing a moisture barrier over the concrete surface so that your laminate floor will last. Can I use my old carpet underlay with laminate flooring? No, carpet underlay is specifically designed to offer comfort underfoot. If you lay a laminate floor over this type of underlay you will put intense pressure on the joints, which will result in damage to the laminate. What can I do if my floor is making noises when I walk on it? Can a laminate floor scratch? 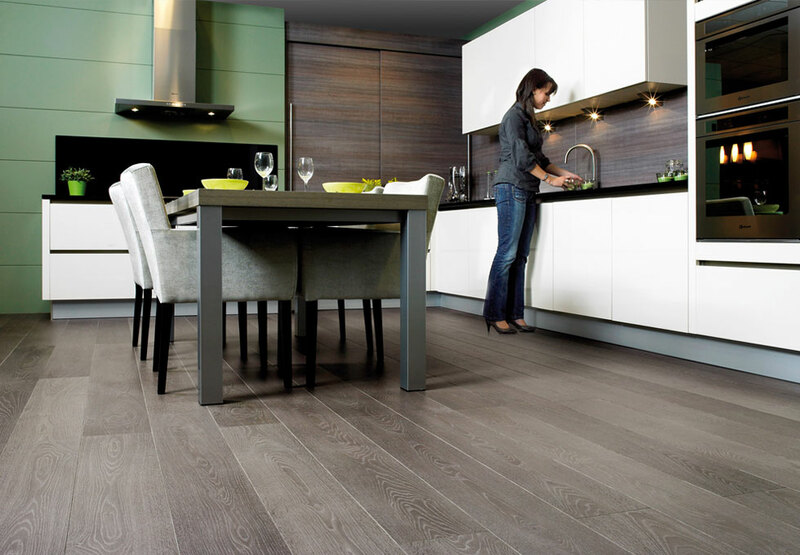 Melamine makes up the surface of laminate flooring, it’s scratch resistant but isn’t scratch proof. Sharp objects can scratch the floor and it isn’t indestructible so make sure you take precautions. Make sure you wipe your shoes to avoid sharp stones, lift rather than drag furniture, use furniture casters, trim dog’s nails and try not to drop any sharp heavy objects onto your floor. When using a vacuum cleaner make sure that the wheels and brush are in working order and don’t drag on the floor. Finally don’t leave water or wet substances on the laminate flooring surface without cleaning them up straight away.  5/ 5 stars Excellent professional service carried out efficiently from the first visit to the shop to the completion of the job. Delighted with the end result and a fair competitive price.